TRADITIONAL GERMAN LEDERHOSEN: Want to catch a few eyes at your next social event? Slap on a pair of traditional German lederhosen and you’ll be the life of the party. Love it or laugh at it, the leather pants worn by Bavarian men (and sometimes women) are one of the world’s most striking costumes. 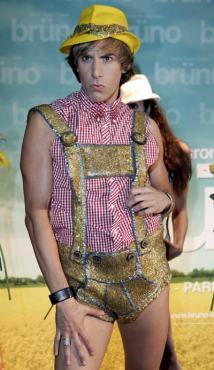 Lederhosen is traditionally southern Bavarian and Austrian clobber. Up until a few years ago Germans from Berlin or Cologne wouldn’t have been seen dead in a pair except at the Munich Oktoberfest, where they’re manly de rigueur. But how did lederhosen become so popular? Let’s look at the story behind the shorts. pretty similar to the the Munich Oktoberfest. Germans use to refer to one pair of Lederhosen. The history of using fur or animal hide for pants goes all the way back to Otzi the Iceman, the 5,300-year-old frozen mummy of whom was found near the Alpine Austro-Italian border in 1991. But lederhosen as we know and love it today first took shape in the 1700s. It had been reasonably common across Europe for peasants to wear leather pants for farm work, horse riding and hunting. But it was the Bavarians who invented the drop-down flap at the front. The French even dubbed it à la bavaroise, meaning in "in the Bavarian style". In those days Europe’s aristocracy liked to dress up as peasants for fun, and so lederhosen became popular across all strata of society. Poorer folk dyed goat or sheep skin black for their pants, which were either short or full length "Bundhosen" style. It was the nobility who started wearing the soft, brown lederhosen made from deer or chamois skin that’s the most common variety today. Lederhosen fell out of fashion for a while in the 1800s as pants made from cotton or cloth started to take over. An upstart called Joseph Vogel led a revival in 1883, when he and his mates from the pub gathered to protest a decline of Bavarian values. The six of them started the first Tracht preservation society and even wore their short-length lederhosen to a church service in the town of Bayerischzell. The priesthood condemned the shorts as an affront to decency and tried to have them banned. But Bavarian King Ludwig II professed he was a fan and that was that. Farmers and aristocrats alike started donning lederhosen again. But it was another Bavarian who really dealt the death blow to lederhosen being widely worn in everyday life. His name was Levi Strauss. Strauss hailed from a town near Nuremburg in northern Bavaria (a staunchly non-lederhosen wearing area) and migrated to San Francisco during the California Gold Rush. His blue "jeans" took over as the world’s most popular pant and the rest is history. Among the most memorable lederhosen advocates in the 1900s was Bavarian writer Okskar Maria Graf who fled to New York during the Third Reich days. Graf wore his lederhosen around Manhattan until his death in 1967. These days lederhosen are usually reserved for beer festivals like Oktoberfest and other cultural events. But you can still see Bavarians wearing lederhosen as everyday garb in über-traditional towns like Garmisch-Partenkirchen. 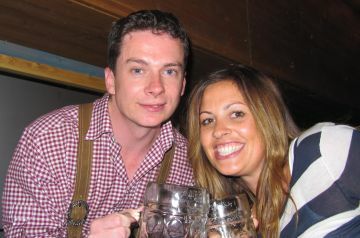 Lederhosen are being worn by more and more women as well. They’re cut differently to men's lederhosen, are often short and are often very appealing. Some people think women wearing lederhosen are just being trendy and they should get back into their Dirndl dresses. But that's not fair, because although girls in leather shorts are a new addition to the Oktoberfest, female farmhands and milkmaids have worn lederhosen for centuries. Many styles of lederhosen have a long history so there's no one type that could be considered really traditional German lederhosen. Lederhosen in Germany can cost anywhere from €100 for the cheapest, imported stuff up to thousands of euros for a top of the range, tailor-made pair. In Munich they’re often sold as a set, coming with a shirt, socks and leather shoes. 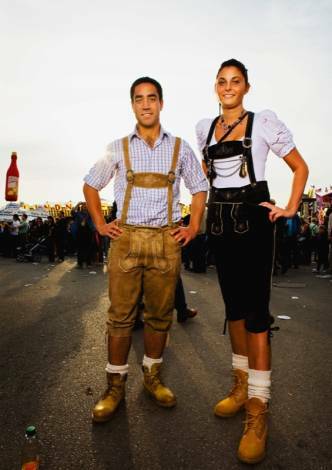 Lederhosen can be either long or short: ending above the knee, below the knee or going all the way down to the ankles. Full-length lederhosen are often worn without suspenders. Colours range from black, different shades of brown through to light tan and grey. There are also two types of suspenders, the "V"-style and the "H"-style, which often have a colourfully embroidered pattern on the cross piece (Stegträger). ▪ Bruno-style – Don’t worry, the type of lederhosen worn by Sacha Baron Cohen’s gay Austrian fashion guru Bruno doesn’t really exist, not in traditional Bavarian society anyway! Leave it for the stag parties, guys, this style is definitely not Oktoberfest-worthy. ▪ Schuhplatter Lederhosen – Schuhplatten is the thigh-slapping Alpine dance immortalized by Chevy Chase in the film European Vacation. The traditional Schuhplatter style of lederhosen is black, tight, and has rich green or white embroidery. ▪ Shoes - Do not wear sneakers with your lederhosen unless you want to stand out like a chicken suit in a church. Traditional Bavarian shoes, Haferlschuhe, are usually brown and their design is said to have been inspired by a goat’s hoof. ▪ Socks – Are usually cream or grey and can be knee-length, ankle-length or Loferl-style. Loferls are ankle-length with an extra band around the calves. ▪ Shirts – worn with lederhosen are usually plain white or have blue or red checkered patterns. White or cream shirts are often adorned with embroidery and buttons made of bone. ▪ Jacket – Traditional German lederhosen jackets are called Janker and are usually green, brown or grey have a thin green collar. ▪ Jewellery– A chain, called a chiavari, is sometimes worn with lederhosen across the top of the flap. Chiavari can be decorated with old coins, animal teeth or other lucky charms. A small pocket knife or Trachtenmesser is sometimes carried in a side pocket. 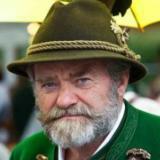 ▪ Hats – Older men often wear green or black felt hats, sometimes decorated with badges, or more notably, a Gamsbart, the beard of a chamois (Alpine elk). • Learn about the beautiful German Dindl dress at German Dirndl. • See galleries of Lederhosen pictures at Bavarian Lederhosen photos and Lederhosen Photos. • Go from Traditional German Lederhosen to learn more about Bavaria's heritage at Munich Backstory. • Jump from Traditional German Lederhosen back to Destination Munich Home.